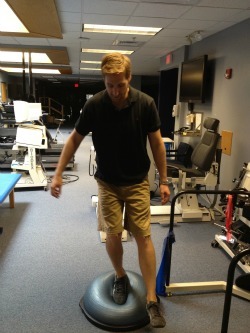 An excellent way to further challenge your legs is by adding BOSU ball exercises to your golf weight training program. You can target all of the major muscle groups in your legs with a BOSU ball, and the instability that the BOSU ball provides will also give some secondary stabilizer muscles a workout as well! A BOSU balance trainer gives you a lot of flexibility in your workouts because you can use it in two different ways, either ball side facing up or down. Each position will provide a different workout. Also, the amount of air in the ball will alter the difficulty of the exercise. While I wouldn't perform any workout routine that was solely consisted of BOSU exercises, I think that they are beneficial in small doses. Regular squats getting too easy? 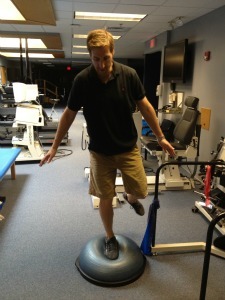 Stand on a BOSU and try it! You will be amazed how much more your entire body works with a little instability added in. So please check out the exercises below for lower extremity exercises. Many of them seem quite simply from the surface, but once you try them, you will be pleasantly surprised by the challenge they provide. - Start by standing close to the ball, with the ball side facing up. - Step up onto the ball using your right leg, hold for a brief second, and return to the ground. - Perform your set number of reps and perform the same exercise with the left leg. If you need more of a workout, hold either free weights or a medicine ball. 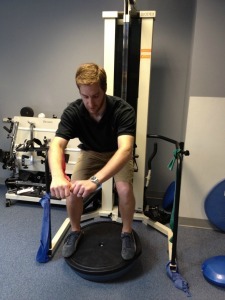 - Stand by the BOSU ball with the ball side facing up. - Step up onto the ball with your right leg, but don't let your left foot stop at the top. Instead, swing your left foot forward and step off of the ball, landing on the ground with your left foot. - Perform the exercise slowly, focusing on lowering your body back to the ground. Turn around and repeat the exercise again, stepping up with the left leg first this time. This exercise can also be performed laterally, where you side step over the ball. -Stand beside the ball, with the ball at your left. Laterally step up to the ball with your left leg. -Balance and then bring your right leg also up onto the ball. -Step off the ball to the left, with your left leg, and then follow with the right. -Repeat by stepping back over the ball to your right. 3. 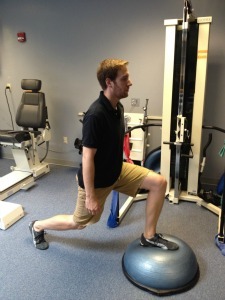 Squats -This will be one of the most challenging BOSU ball exercises for your legs. It can be performed either with the ball side up or down. I actually prefer the ball side down because it keeps your ankles in a natural position, and you will get more instability. Also, perform this exercise near something sturdy to hold onto, either a machine at the gym, or in a door frame at home. - Step onto the ball, and move your feet to about shoulder width on the platform. - Perform a squat, emphasizing your glutes by sticking your rear-end out, and try to keep the ball level. 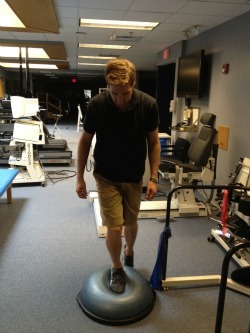 There are many ways to make this BOSU ball workout more challenging. You can close your eyes, hold a weight, or if you have a partner, throw a medicine ball back in forth while performing the squats. -Start with the ball facing the ceiling. Perform a traditional lunge, with your foot landing directly on top of the ball. -Return to the standing position and repeat, switching legs. This also can be made harder by adding weights. 5. Single Leg Balance - This can be performed either with the ball side up or down. Simply balance on one leg and try to hold for at least 10-15 seconds. This can be made harder by closing your eyes, or throwing a ball back and forth with a partner. 6. 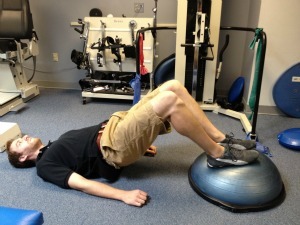 Bridges - Lie on your back, with the BOSU ball side up located at your feet. Bend your knees and place both feet on top of the ball. Lift your buttock into the air and hold for about 5 seconds. This can be progressed by adding leg marches while your are in the bridge position.